Below you will find some more detailed information about the organization, and specifically about the values and policys that all Seaflex employees adhere to. Description: Holding company with ownership of all subsidiaries. Owner of all patents and trademarks for SEAFLEX. Description: The main company, responsible for assembling all SEAFLEX products, active presence all over the world except North America (see Seaflex Inc.). The registered office of Seaflex AB is close to the Arctic circle, in Umeå, Sweden. Through distributors, around 97 percent of our sales are exported every year. 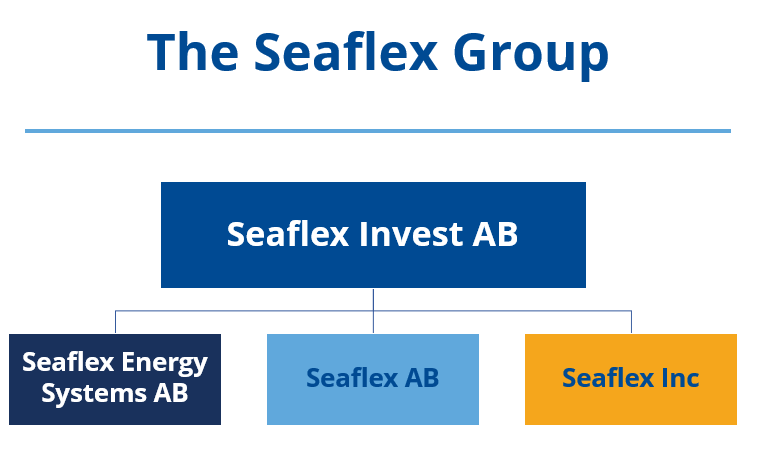 Seaflex AB possesses considerable expertise regarding its principal product, moorings, and we have developed and improved all products right from our concept. We have extensive knowledge of computations and how forces can affect different kinds of moorings, and take good care of our customers at all levels. These documented skills and knowledge enable us to be a company with considerable expertise of the SEAFLEX mooring system, energies, forces, and related computations in marina environments. Our strengths are the products and the staff, who provide support and monitor installations from start to finish. Description: The US based branch located in California, mainly active in North America. The office is a complete Seaflex office, meaning that it employs salespeople, engineers, administrators and logistics planners in order to be able to handle orders from quotation to shipping. Description: A joint venture specifically focusing on the energy sector (renewable wave- and wind energy applications moored with SEAFLEX). Active all over the world. The quality and environment guidelines of Seaflex is the basis of the company culture, which has been developed over the past 30 years. Our quality and environment policy will continue to evolve and adapt to an ever-changing world, while maintaining the core values – that have not changed since the beginning –reflecting our stance on honestly, fairness and consideration. All employees at Seaflex commit to representing the company in the best way possible. At Seaflex, our work is always performed according to the company’s two most basic business values. Every employee at Seaflex should always give every customer the best possible support and service. SEAFLEX is a product that can be used no matter if you want to build the world’s biggest marina, or moor your private boat to a small residential dock. Each and every one of our customers is equally important, and should be treated in the same respectful manner. Service and support does not only entail being professional in the contact with customers; it also means giving that “little extra” and showing a genuine interest in the needs and wants of the customer. Even employees that are not regularly in direct contact with customers are expected to be able to represent Seaflex in an ethical, professional and service-minded way. In all our endeavors we will strive for results of the highest quality. Quality is a key concept within Seaflex. We always work with high-quality material, we perform continuous quality controls and ensure that we can be proud of the products leaving our factory. However, quality is not only connected to the product. Quality also includes the daily work being performed outside of assembly: in all of our meetings with customers and the administrative work performed by all employees.